Utah Roll Out Rack offers Industrial Storage Products which can save you time and space. We have what you need. Our business is to weigh your goals, and deliver a system to compliment them. The Design Occupies 30% Less Space than Our Standard Model and is Perfect for a Wall Application. This option is available in all the same sizes as our standard model. SpaceSavers can effectively increase capacity as much as five times. They provide additional storage by utilizing the cube in the racks up to 20 feet high. 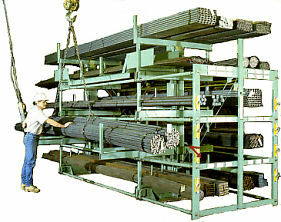 These roll-out racks offer a new and convenient method of storing steel or other materials of various sizes and shapes in virtually any length and weight. The receptacles on each side of a SpaceSaver Rack easily roll-out into the aisle allowing unobstructed overhead crane access to their contents. The weight capacity of a SpaceSaver Rack is remarkable. Our 4T-20' model, having eight roll-out receptacles (four per side), can accommodate 145,600 pounds. Standard receptacle widths and weight capacity. The 20" wide receptacle has the greatest weight capacity at 6,600 lbs. per arm (2 arms = 13,200 lbs. per receptacle) and is suited for mill bundles of steel bar. The 24" wide receptacle provides both large weight capacity, 5,600 lbs. per arm, and more room. It works well with structural and storing more than one item per receptacle. The 36" wide is designed for products where bulk or space is more important than weight like pipe and tubing. Interlake and Fraizier Pallet Rack are leaders in steel storage products, and that allows us to deliver a product with quality second to no other. Since Nationwide Shelving is a top shelving provider, we are able to keep our prices low, virtually beating any price for our products on the market today.